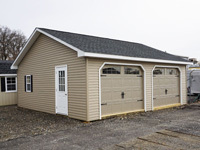 Our Duratemp two car garages are available from 20 feet by 20 feet all the way up to 24 feet wide by 40 feet deep and are built to last with solid wood construction. 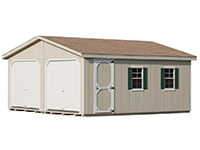 20' wide garages come with two 8'x6'6" carriage-style garage doors with sunburst and 24' wide garages come with two 9' x 7' carriage-style garage doors with sunburst. 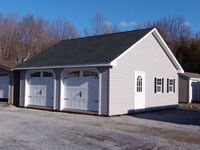 One story A-frame garages have a 4/12 roof pitch and two story A-frame garages have a 7/12 roof pitch. 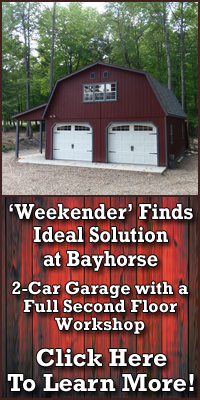 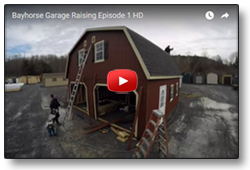 Our Dutch two-story garages feature a Dutch Gambrel-style roof with two slopes on each side. 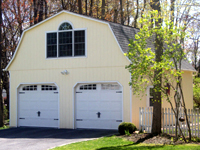 The upper slope is positioned at a shallow angle, while the lower slope is steep. 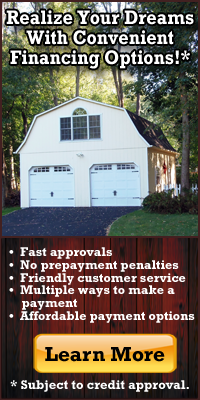 Each garage is hand-crafted in the United States by expert Amish woodworkers and available with your choice of 18 paint and trim colors on LP Smart Panel siding (50 Year Warranty) and a wide range of lifetime architectural roof shingle colors. 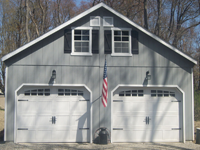 Additional optional doors and windows are available to meet your specific requirements.